“Good wine, great value” — that’s been Chile’s wine reputation for many years. And while this isn’t a bad thing by any means, it is a bit of a self-limiting category. “Great wines” might be a more desirable label, or maybe “great values, great wines.” But things are changing in Chile. Is it time to rethink Chilean wine? 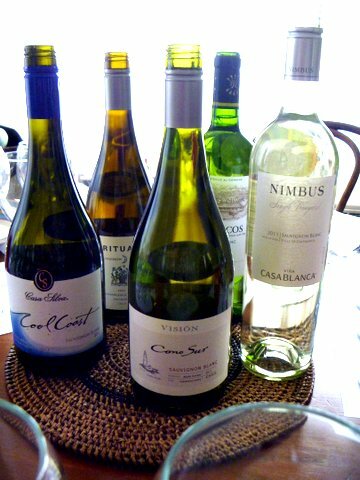 This post is inspired by a pair of tastings of Chilean Sauvignon Blanc. The first was in London at Decanter magazine’s headquarters, where a team of four experts tasted 80 Chilean Sauvignon Blanc wines for a report just published in the June 2012 issue. The tasters included Peter Richards MW, Mel Jones MW, Juan Carlos Rincon and Annette Scarfe. The second tasting, a much more casual affair, took place 4500 miles away at our house in Tacoma. Sue and I were joined by three of my University of Puget Sound “Idea of Wine” students for a tasting of wines supplied by Wines of Chile. We tasted five Sauvignon Blancs (see wine list below) that were sent to us along with three Chardonnays that we tasted separately. I was very interested to hear what my students would have to say about these wines. Abby and Marina studied abroad in Chile, so they brought some regional focus to the group. Ky is a quintessential Millennial wine “newbie” with a refreshingly open and thoughtfully candid attitude. They were the perfect tasting team to balance the experienced Decanter experts. Sauvignon Blanc is an important factor in the Chilean wine industry, as this table from the Wines of Chile Strategic Plan 2020 makes clear. Sauvignon Blanc is now #2 in the export dollar league table behind Cabernet and ahead of Merlot and Chardonnay. Exports of Sauvignon Blanc almost tripled in dollar value between 2002 and 2009 — much faster growth than Cabernet, Merlot or Chardonnay. Why? One theory is that Chile has ridden New Zealand’s wave. Certainly Marlborough Sauvignon Blanc has opened doors and minds to Sauvignon Blanc, to the benefit of producers in South Africa, Chile and elsewhere. But the Decanter tasters have a better theory: the wines themselves have improved as winemaking practices have caught up to the global “best practice” standard. Decanter’s team recommends buying the most recent vintage of Chilean Sauvignon Blanc not just for freshness but because they believe the quality of the wine making is improving every year. That said, stuff sometimes happens and the Decanter team reported a few bottles that suffered from too much sulfur or excess acidity. We had the same problem — one of our five bottles pushed acidity to the borderline in our opinion. Of the 80 wines that the Decanter team judged, two earned 5-star honors, twelve received four stars and 50 were “recommended” 3-star winners. Fifteen wines were judged “good values.” Is this a good showing? Yes! A review of 121 Argentinean Malbecs in the same issue produced three 5-star wines, sixteen with 4-stars and 55 “recommended” 3-star wines. Twenty were declared good values. Adjusting for the number of wines sampled, I think you’d have to declare it just about a dead heat between Argentina and Chile (a statement that is likely to provoke a response on both sides of the Andes!). We enjoyed the wines and commented upon the French stylistic influence which made them a change from the New Zealand wines we often drink. How did they compare to the wines you drank with your homestay families in Chile, we asked Marina (upper photo) and Abby (shown with Ky in the lower photo)? We didn’t drink white wines, they both replied. Always red. “At the top end, I think New Zealand is still ahead of Chile, because the experience it has counts for so much,” according to one of the Decanter reviewers. “But the very best Chilean Sauvignon Blancs are fantastic wines that can more than hold their own in a global context. Chilean Sauvignon Blanc is a fantastic value for money next to New Zealand, South Africa and the Loire, and that is its forte”. 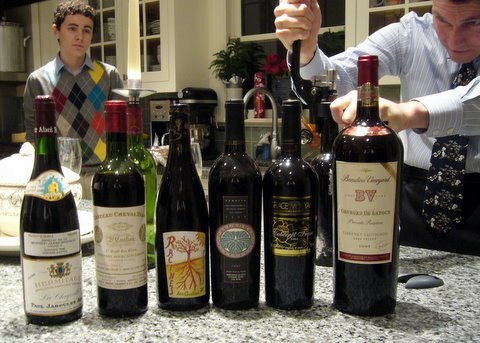 Overall these wines were very good — we will certainly enjoy them with summer meals — and our ranking of individual wines matched very well to Decanter’s point scores. Yet we a little disappointed. Good, no question, but not great. Or not yet great. If quality continues its upward trajectory, “great wines, great values” may soon be within Chilean wine’s grasp. Thanks to Wine of Chile for supplying wine, olive oil and spices for the tasting. Here is a list of the Sauvingon Blancs we tasted along with their U.S. suggested retail prices. Cam watches Ken nurse the cork out of a bottle of 1960 Taylor Vintage Port. The last Saturday of February is a holiday for wine lovers: Open That Bottle Night (OTBN). It’s the evening when wine enthusiasts come together to share wine and stories. Although the wines are the official reason for these gatherings, the people and their stories are what it is really all about. This year Sue and I will be getting together with Bonnie & Richard, Ron & Mary and Michael & Lauri at Ken & Rosemary’s house in Seattle. Everyone’s bringing wine and a story about the wine and Rosemary is making another of her spectacular meals. I’ll report the specifics in a note at the bottom of this post. The premise of OTBN is that wine is different — or maybe that we are different when it comes to wine. Americans are famously interested in instant gratification — we want what we want when we want it. That’s one reason the U.S. saving rate is sometimes a negative number. Can’t wait — gotta have it now. That’s our typical consumption profile. Isn’t it interesting, then, that we sometimes behave in exactly the opposite way when it comes to wine. Yes, I know that 70% of wine is consumed within a few hours of its purchase. That is unexceptional. No, what I’m talking about is our counter-stereotype tendency to tuck special bottles away and save them for … for what? For the right occasion, I suppose. For the moment when they will mean more than they do just now. Sometimes it is about proper aging of the wine, but usually there is an intangible component that transcends the bottle’s contents. For whatever reason, it seems we need to be reminded once a year to get these wines out and enjoy them! Frequently (in my case, at least) we hold them too long so that when the cork is finally pulled the wine within is a shadow of its former self. The interesting thing is that it usually doesn’t matter that the wine has faded away. Turns out it was the story that mattered most. Liquid memory! John Brecher and Dorothy Gaiter invented OTBN in 2000 as a way to celebrate wine by releasing its pent up stories. Dottie and John wrote the weekly wine column for the Wall Street Journal until quite recently and each year they invited readers to send them accounts of their experiences, some of which appeared in post-OTBN columns. It was quite an experience reading what other people were inspired to say by the wines they opened that night. Kind of a peek into their souls. I think that was the point, however. As Dottie and John wrote in their final column on January 26, 2010. Wine isn’t a spectator sport. It’s utterly intimate. Don’t let anyone tell you what you should like, including us. Try wines broadly—there have never been so many good ones, at all prices, on shelves—and keep raising your personal bar for what is truly memorable, so that you are always looking for the next wine that will touch your soul and make you feel you’ve gone someplace you’ve never been before. It’s not about delicious wines. It’s about delicious experiences. May your life be filled with them. Dottie and John didn’t explain why they left the WSJ — word on the wine blogger street is that it was a simple cost-cutting move by Journal management — but many of us are interested to learn what will happen next. The old WSJ wine column took a very broad view of wine, with reports that ranged from inexpensive bottlings like Two Buck Chuck to icons like Chateau LaTour. The Journal hasn’t given up on wine. The wine page has been filled by a variety of writers and topics since the first of the year. I suspect this is a short term measure until a permanent replacement is found. It seems to me that the WSJ is very ambitious and is trying quite hard to become the Financial Times, rated by many as the world’s best business newspaper. The FT features a weekly column by Jancis Robinson, rated by some as the world’s most influential wine critic. I expect Rupert Murdoch, the Journal‘s owner, to seek out someone of similar stature to anchor the Weekend Journal section (and attract wine-enthusiast readers). Dr. Vino reports that the new columnist will be Jay McInerney, novelist and former wine columnist for House & Garden magazine. It will be interesting to see what direction McInerney (or whoever gets the job) takes at the WSJ. It is one of the world’s great “bully pulpits” when it comes to wine. Jancis Robinson uses her position at the FT to promote fine wine in a global context to her audience of “Davos Man” global elites. She has been very effective at raising wine’s profile around the world. Dottie and John embraced wine and globalization, too, but in a very American way for a broad American audience. They were effective, too, in the American context. It will be interesting to see what direction the Wall Street Journal chooses, what idea of wine they embrace and what audience they hope to serve. In the meantime, it’s time to open that bottle. The Wall Street Journal has confirmed rumors that Jay McInerney will be a wine columnist for the paper, but it throws in an unexpected curveball: his column will alternate, Saturday to Saturday, with one written by Lettie Teague. 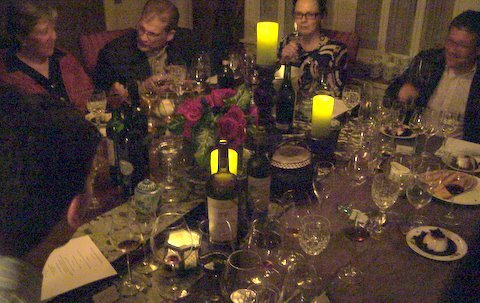 We had great wine, spectacular food and fascinating stories on Open That Bottle Night 2010. By the numbers: five and a half hours, ten people, thirteen wines, 75 wine glasses. Here are the food and wine menus — you will have to imagine the stories. Special thanks to Rosemary and Ken for hosting. And thanks to Dottie and John for inventing OTBN. I was trying to explain to my students the lasting importance of Robert Mondavi and I suddenly realized that Julia Child was the key. Mondavi tried to do for wine in America what Julia tried to do for food. This made me think about other parallels between our wine and food cultures — and the significance of the last issue of Gourmet magazine. Condé Nast announced yesterday that it was pulling the plug on Gourmet magazine, America’s signature culinary monthly since 1940. The cause of death, clearly, is the economic crisis, which has reduced advertising pages by over 30 percent. Gourmet‘s subscribers (there are nearly a million of them) will have to find something else to read on the still-cluttered Food & Lifestyles section of the newsstand. Bon Appétit (another Condé Nast title) is the obviously choice, although it is not a perfect substitute — more recipes I’m told, and less upscale travel and leisure. Gourmet‘s obituary appeared everywhere — even on the front page of the New York Times. The Times made it clear that this wasn’t just a business decision (although Condé Nast assured us it was — the McKinsey consulting firm made the call). This is really the end of an era. And not a good end. “It’s Rachael Ray’s world now,” the story declared, referring to the 30-minute-meal Food Network star; “we’re all just cooking in it.” Roll over, Julia Child (as Chuck Berry might have said) and tell Escoffier the news. Setting aside for a moment the premise of the Times article — that Gourmet defines the era — I wonder if what’s true for food in America is also true for wine? This must be a valid concern because it is he gist of the question that I’m most frequently asked by journalists — is the current slump in fine wine sales (especially wines selling for $20 or more in the shops) a temporary trend or a permanent shift in demand? Is this the end of an era for wine? When the economy perks up eventually, will people want to buy very expensive wines again? Or is the switch to cheaper, simpler wines (my made-up Rachel Ray Chardonnay) here to stay? The question became more interesting as I read the Times article. I tried to substitute wine terms for food terms in the article and it seemed to make sense. Here’s what I mean. The death of Gourmet [insert name of expensive wine] doesn’t mean people are cooking less [drinking less] or do not want food magazines [good wine], said Suzanne M. Grimes, who oversees Every Day With Rachael Ray, among other brands, for the Reader’s Digest Association. It has also become democratized via the chatty ubiquity of Ms. Ray [Gary Vaynerchuck?] and the Food Network stars. Ms. Reichl [the Gourmet editor — insert Robert Parker or maybe Jancis Robinson] is a celebrity in the food [wine] world, but of an elite type. She [or maybe he] “is one of those icons in chief,” said George Janson, managing partner at GroupM Print, part of the advertising company WPP. But what harried cooks [budget conscious wine drinkers] want now, it seems, is less a distant idol and more a pal. The substitution works, pretty well, don’t you think? And the McKinsey consultants surely did their job. Food and wine down the tubes. Maybe Robert Mondavi and Julia Child are both turning in their graves! But rumors of the death of both fine dining and fine wine are probably exaggerated, as Mark Twain might have said. Gourmet is an iconic brand and the fact that Condé Nast cut it rather than Bon Appetit surely does mean something. But we have to remember that print magazines themselves are an endangered species in this internet age. What information we consume and in what form are both changing very rapidly. 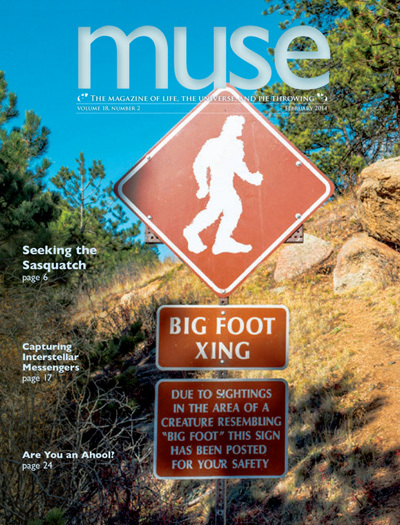 Magazines will change rather rapidly in the next few years to remain relevant or else they’ll fade away. Gourmet isn’t the first and won’t be the last to bite the dust. So I am not willing to declare fine wine (or the Gourmet food lifestyles) dead on the basis of this news alone. The question of whether Americans will return to their old wine-drinking habits when the recession ends remains open for now. Note: A lot of great wine writing appeared in Gourmet over the years. Look for a future post that tries to understand the changing American wine work through the Gourmet lens. Jancis Robinson and Wine Economist Mike Veseth at the IPNC. Wine Festivals draw celebrity wine critics, who taste, talk, sign books, pose for photos and lend credibility to the event. Wine festivals have become big business. So big that the Wall Street Journal publishes a guide to upcoming festivals in each Friday’s edition. Click here to see their online August festival listing.There are lots of different wine events, but I’m not talking about charity wine walkabouts here, where you make a small donation, get a few drink tickets and visit tables where random bottles of donated wine are poured. The modern wine festival is a lot more focused and sophisticated and designed to engage wine enthusiasts on a different level. The International Pinot Noir Celebration (IPNC) in McMinnville, Oregon is a good example of the state of the art in wine festivals today. Sue and I attended the grand tasting last Sunday (a chance to sample dozens of Pinot Noir in a beautiful but hot outdoor setting), but the real deal for serious Pinot lovers is the full three day festival. For a fee of about $900 per person (not including lodging) you spend your days in tastings, seminars and vineyard tours and your nights under the stars at grand dinners. The festival attracted winemakers from Oregon, California, Washington, Canada, France, Austria, Australia and New Zealand — quite an international lineup in a recession year. I’m told that about 400 people attend the big festival — many of them come back year after year — and I would guess that another 300 or so came to the grand tasting on Sunday, so the festival’s total budget must approach a half-million dollars. More than enough to pay the expenses of wine critics and celebrities (like Jancis Robinson above). It is interesting to consider what brings all these people together? Yes, yes, I know that it must ultimately be about buying and selling wine, but that doesn’t fully explain it. No wine typically changes hands at events like this and there are probably more cost effective ways to market wine, from the supplier standpoint, and cheaper ways for consumers to fill their glasses, too. So what’s really going on? One reason winemakers travel so far to attend these festivals is to communicate with other producers and to taste and compare their wines. Although I still don’t fully understand it, I have observed a subtle kind of dialogue when winemakers taste together. Information about taste, technique and status are all transmitted in the glass. Professors go to conferences and communicate by reading papers. Winemakers go to festivals and taste each others’ wines. It is easy to see who has the more sensible approach to intra-industry communication. I suspect that there was a lot of producer dialogue at the Pinot festival because the wines that we tasted did not have much in common except the genetic pedigree of the grapes used to make them. Although the world wine market is moving to a lingua franca based upon grape varietal labeling (Chardonnay not Chablis, Pinot Noir not Burgundy) it is very clear that wines made from Pinot Noir grapes can have extraordinarily different textures, flavors and aromas. depending upon who makes them, how and where. The Old World naming system (based on place not varietal) sure has its merits in the wineglass where terroir is actually experienced — too bad it works so poorly in the cluttered supermarket aisle when wines are bought and sold. I met more than one winemaker who told me basically that she came to Oregon to prove something — to prove that good Pinot Noir could be made in X where X = Oregon, Austria, California, Australia — fill in the place — only Burgundy has nothing to prove. A good deal of business gets done whenever producers come together, as you might expect. Partnerships, consulting services, distribution agreements and so forth are frequently arranged. The McCrone vineyard wines made by Ken Wright Cellars and Ata Rangi are a good case study of the sort of connections that probably could only happen in face-to-face meetings at a wine festival. Don McCrone is a distinguished retired politics professor turned distinguished active winegrower. His vineyard outside of Carlton, Oregon produces amazing fruit, which winemaker Ken Wright turns into a wonderful single-vineyard bottling. Don and Carole McCrone met the winemakers from New Zealand’s famous Ata Rangi winery at IPNC a few years ago and were encouraged by them (while tasting each others’ wines, no doubt) to scout out vineyard properties in Martinborough. Now the McCrones spend half of the year in each hemisphere supplying grapes to both Ken Wright and Ata Rangi for “McCrone Vineyard” wines. Are there any other winegrowers with vineyard designated wines in both hemispheres? It is an extreme example of the sort of cross-fertilization that can happen behind the scenes at major wine festivals. I think that the most important function of wine festivals is to establish and build relationships. I always say that wine is good, but wine and a story is better. Wine and a relationship (even a superficial one with the grower, the winemaker, or other wine enthusiasts) is best of all. Doug Tunnell, winemaker at Oregon’s Brick House, explained to me that he brings his wines to IPNC every year to maintain contact with the people who attend. I got the impression that it isn’t so much about selling wine as honoring relationships. I think elite makers recognize that investing in relationships with customers (and with wine critics and journalists and all the others who attend these events) pays dividends down the road. Winemaking and relationship-building both require a long-term perspective. The fact that many people come back to IPNC year after year suggests that they value the relationships, too, both with the producers and with each other. I have written that wine always tastes best when it is shared with others who enjoy and appreciate it. This may be especially true with festivals like IPNC, which tend to attract participants who are especially focused on a particular wine or region. So here is what I think I have learned from my fieldwork at wine festivals so far, both at IPNC and elsewhere, on both sides of the table, both pouring and receiving wine. Wine festivals aren’t really about the wine, they are about the people, the conversations and the relationships. The role of the wine is to bring the people together and to give them something to share in a way that is impossible to recreate electronically. Wine, or really the sharing of wine, is a personal relational experience in an otherwise increasingly impersonal transactional world. That people seem to appreciate this sort of experience (and seek it out, even at high monetary cost and even in a deep recession) suggests something about its scarcity, don’t you think? Decanter, the self-proclaimed “World’s Best Wine Magazine,” takes its rankings very seriously. Wine rankings, of course, and, in the July 2009 issue, Power rankings. Who are the most powerful people in the world of wine and what does the power list tell us? Let’s see if we can find the message in this bottle. The names on the power list are very interesting but the story that they tell about wine today is perhaps more important. Here are the first ten (top ten) people on the list. Since Decanter is a British magazine with very small US distribution you might be surprised that three of the top ten positions (and both of the top spots) are held my Americans, but don’t be. Constellation Brands is the largest wine company in the world and accounts for one out of eight bottles of wine sold in the UK. And Robert Parker is best known for his ratings of French wine, not Napa bottlings, which is important to British buyers and merchants. The presence of Sands and Parker at the top of the list does not reflect any sort of US-centrism, just the realities of the global marketplace. It really is a global list. Or at least, like those famous New Yorker cover illustrations, the globe as seen from London. I won’t list the second ten names (out of 50 in total), but the I think they illustrate the global reach of the wine market today: America, China, Chile, Australia, Spain and so on. Even India, an emerging wine market, makes the top 50 ranking. The list is complete and up-to-date (Gary Vaynerchuck, the US internet wine guru, shows up at number #40), but there are some interesting gaps. Fred Franzia, the godfather of Two Buck Chuck, is nowhere to be found, for example, despite his obvious influence on the US market, while Judy Leissner of Grace Vineyard in China, who perhaps represents the future of Chinese fine wine, makes the “Ones to Watch” list. It is fun to see who makes the list and who doesn’t (why Jancis and not Oz? ), but the ranking is more interesting if you strip out the personalities and consider what market forces they represent. Herewith my version of this story. The world of wine is very unsettled. Although wine is one of the most fragmented global industries (much less concentrated than beer or spirits, for example), size matters more and more as consolidation continues. [Hence the power of Constellation Brands, Pernod Ricard and Southern Wine & Spirits.] Reputation matters, of course [Parker and Robinson], but the world is changing and everything is up for grabs from how and where wine is sold [Costco and Tesco] to how the bottle is sealed [Alcan]. Although change is generally associated with New World wine, this is no longer the case. The biggest threats to “business as usual” for Old World wine come from inside the European Union itself. On one hand, the new EU wine regime [Mariann Fischer Boel] will pressure Old World wine to compete with the New World head-on and without continuing EU support. On the other hand we have an unexpected prohibitionist movement [symbolized by Sarkozy] that seeks to regulate wine like the Americans do (even as some parts of America are changing) — as a dangerous controlled substance. It is thus imperative for Old World wine to master the tricks of the New World industry — tricks that Constellation and Southern and Costco symbolize. These changes take place, of course within the context of the expanding global market, global climate change and a continuing global economic crisis (that’s where a wine economist would have been a useful inclusion). I won’t pretend that the Decanter Power List is a scientific ranking (Decanter doesn’t claim this in any case), but it is an interesting peek into how wine insiders view their industry. I’ll be curious to see how the names and the story lines change when the next Power List appears.